Clean styling with visual impact. Modern layouts adapt to any screen size. Just answer our questionnaire and send us your photos. We’ll do the rest. 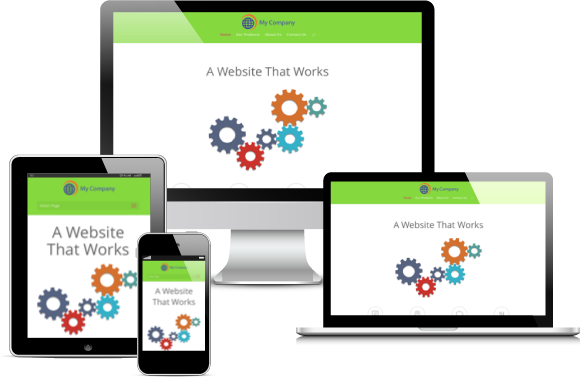 We build websites that work. We believe that every effective website has one focused, overriding goal, be it to get a visitor to make a purchase online, or often more realistically, to leave their contact details so you can get in touch with them to promote your product or service. We therefore take a minimalist function-oriented approach to design. No flashy ego-boosting designs just for the sake of it. Every element we use helps to guide the visitor towards the site goal. Everything else is just a distraction and is omitted. Ours is what you might call an opinionated design service. These opinions, however, did not just appear out of thin air. They are backed by decades of experience and by recent consensus in the fields of web design and online marketing. They are based on principles that have been proven to work and are used by the most successful internet businesses today. Trust us in our approach, and we will build you a website that adds true value to your business. What content should I put on my website? We will send you a questionnaire asking about relevant details and for text and image content to be used on your site. The questionnaire is designed to elicit from you ONLY the content that needs to be on your site. Yes you can! We use the industry-leading CMS WordPress to build your site, and give you Editor access so you can log in and make changes or add posts or pages to your heart’s content (pun intended). Can I add more content to a Starter site? Absolutely. The only difference between the Starter and Complete packages is the amount of content that we initially build for you. After we have completed your site, you can add as much content as your disk space limits allow. Note that if you’re planning to host thousands of huge photos or videos then this may not be the service for you. Does the price include web hosting and domain registration? Click the button below to see package inclusions and pricing. If you have any more unanswered questions, please contact us any time using the contact form below. wwwhiz.com is owned and operated by Nuspace Net Pty Ltd (ACN 624 613 038), based in Cairns, Queensland, Australia.